If you love to cook, then having a collection of herbs, spices and seasonings on hand is essential to adding flavour to any dish you create. However, tucking them all away in your kitchen cupboard means that you often forget what’s readily available, and you’ll only end up throwing things away that went out of date seven years ago. A spice rack is a must for any budding chef – and anyone fanatical about good kitchen storage. We’ve picked out some of the most practical and stylish spice racks for kitchen counters and cupboards. From fully stocked rack carousels to basic wire chrome racks, there’s something for every type of chef! What to consider when buying a spice rack? Spice racks allow you to display all of your seasonings in a stylish and practical way, which ultimately makes cooking a breeze. Most spice racks you buy will come with a selection of seasonings which can then be replaced or refilled depending on your preferences. Or, if you’ve already got a cupboard full of spice jars then there are plenty spice racks you can buy that come on their own, so you can fill them with your favourite seasonings. If you're designing a small kitchen, then racks that attach to your cupboard doors are a handy space saver, but if you like everything to have its place, a rotating spice rack could be a nice and stylish addition to your kitchen worktops. Make sure you buy a spice rack that is a suitable size for you, if it’s too small then you’ll only end up filling the cupboard again, and if it’s too large then it can look a little sad if not fully stocked. This Cole & Mason carousel spice rack comes fully stocked and ready to use in the kitchen. The glass jars look smart with their sleek chrome lids, and users say it is very convenient to be able to spin the carousel and see what’s in stock. The jars aren’t labelled, but this means you can refill them with your choice of seasonings once the included ones run out. Those who cook often love how professional this spice rack looks, and find it sits neatly on the worktop or is small enough to fit inside a cupboard if you want to save on space. This spice rack is organised in the form of drawers which allows generous space for up to 60 spice jars. This compact unit could sit nicely on a worktop and free up space in your cupboards without cluttering up your work surfaces. The spices aren’t on display with this rack but the drawers do come with handy labels so you can quickly locate the seasoning you need when cooking. This simple wire rack boasts no frills but is a compact and reliable design that holds up to 24 spices of your choice. It is able to fit any standard sized spice jar from the supermarket, so you can customise it with all your favourite seasonings. Customers have said this rack is particularly good for Sainsbury’s own herb and spice jars, but it can also accommodate Schwartz and other brands, too. If you tend to vary what spices you buy, this rack is for you. This 16-jar rotating carousel provides a variety of herbs and spices commonly used in everyday cooking. 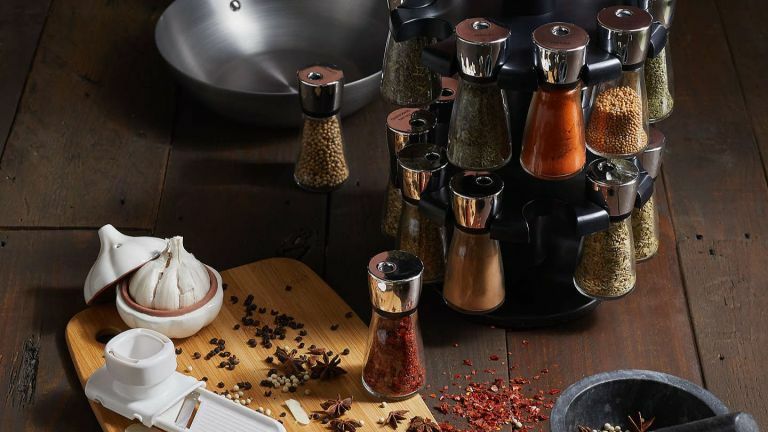 Users have said this spice rack is compact enough to sit on the kitchen counter without being in the way, and it is an easy way to see what’s to hand and what needs topping up. You will, however, need to replace or refill the Schwartz jars as that is the shape and size the carousel is designed to hold. You could always buy supermarket brands and decant them into the existing Schwartz jars if you prefer. If you want to get organised but don’t have the room to display your spices on your worktop, then this hanging rack could be the perfect solution for you. It can be mounted on your cupboard door or wall so that you don’t compromise on cupboard space either. The shelves can accommodate up to 32 spices which is very handy for the budding chef, the only niggle is the chrome wire is placed right across the seasoning label when displayed in this rack. This little spice rack is slightly different to the others in that is comes with mini Kilner jars for you to display your spices in. The jars are empty, which means you can then fill them with the herbs and spices you use regularly, and display them neatly on the rack. It’s a little smaller than other racks, only holding 12 jars, but users have found this is enough for everyday cooking ingredients. You’ll also get 36 labels that are pre-printed labels with some of the most common seasonings on them, so you can customise your spice rack to suit your kitchen. Love a storage jar? Don't miss our clever storage jar ideas. This wall-mounted rack can be attached to your wall in the kitchen to allow quick and easy access to your herbs and spices when cooking. The wooden design features three shelves which hold up to 18 jars and the wooden bars are low enough to ensure you can clearly see the labels on the jars when they’re on display. This rack does require some DIY, but users have said it’s simple to do and although a basic design, looks great when mounted.